Munich - Borussia Mönchengladbach kept their hopes of a securing third place alive after a shock 2-0 victory away to Bundesliga leaders FC Bayern München in Matchday 26's curtain closer. Foals attacker Raffael was the hero of the night for the visitors, scoring twice as Bayern failed to break down a superbly-drilled Gladbach defence. Bayern began in customary fashion, greedily keeping the ball and pinning their guests back deep into their own half. Having anticipated that turn of events, Borussia coach Lucien Favre fielded two tenacious holding midfielders in Granit Xhaka and Christoph Kramer to win the ball back, with the objective being to use the pace of Patrick Herrmann and Fabian Johnson on the wings to do damage on the break. The home team nevertheless broke through Gladbach’s back line as early as the fourth minute when Arjen Robben’s cross from the right found Robert Lewandowski in the box. The Polish attacker chested the ball down but was unable to finish, with Juan Bernat’s follow-up effort from the edge of the area saved well by Yann Sommer. Pep Guardiola’s men continued to dominate thereafter but could find no way through a compact visitors' defence. Against that backdrop, the opening goal came against the run of play. Tony Jantschke’s superb pass released Herrmann down the right wing and his drilled centre was met first time on the half-volley by Raffael on the edge of the box. The Brazilian’s shot was well-struck but straight at Bayern keeper Manuel Neuer, who nevertheless fumbled his save, allowing the ball to trickle over the line and give the Foals an unlikely half-time lead. Bayern again dominated proceedings after the break as they went in search of an equaliser but, with Robben having been taken off with a knock before the break and Franck Ribery absent through injury, they lacked a creative spark able to beat their marker in one-on-one situations. With the defending champions committing numbers forward, Gladbach enjoyed greater space on the break and had a couple of promising openings, but they invariably came to nothing due to a wayward final ball. One counterattack almost came to fruition, however, when Andre Hahn galloped down the right and into the box before unleashing a rasping shot that Neuer tipped onto the post, gathering at the second attempt. Guardiola brought on Sebastian Rode and Philipp Lahm in an effort to reinvigorate his side’s attacking endeavours, but as the match entered the closing stages it was Borussia who were the more dangerous side. Favre's men doubled their lead in the 77th minute following an expertly-executed break. Herrmann’s inch-perfect pass released Christoph Kramer into the box and the midfielder skipped past Bastian Schweinsteiger before laying the ball off to Raffael, who stroked the ball past Neuer with another first-time strike. 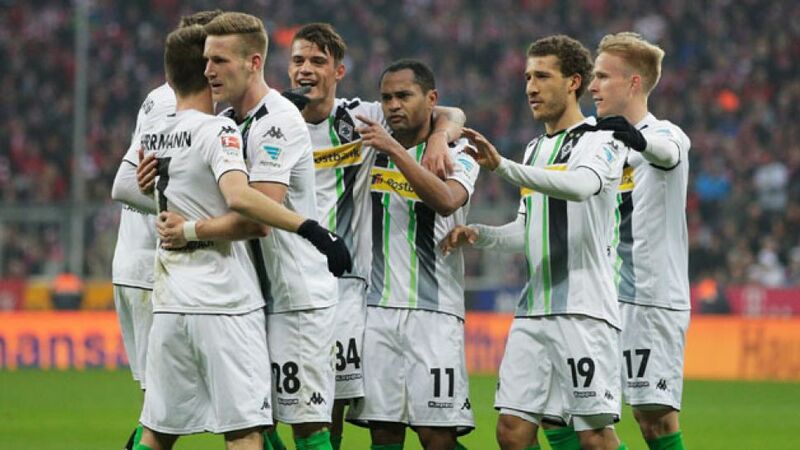 Bayern pushed for a late consolation but Gladbach held firm for a shock victory to stay in third place.